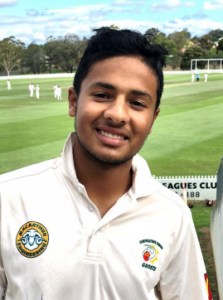 Successful debut: Young leggie Tanveer Sangha, who is just 16, took 5 for 79 for Campbelltown Camden Ghosts against Gordon on Saturday. Next Saturday’s first grade NSW Premier Cricket at Raby between Campbelltown Camden DCC and Gordon DCC promises to be a great day with both teams’ evenly poised heading into day two, reports JASON ELLSMORE. If it wasn’t for a tough final 45 minutes of play on day one, the Ghosts may have considered themselves holding a slight upper hand heading into next week. Ghosts captain Jarred Burke won the toss and sent Gordon into bat in windy overcast conditions. And while two wickets came the Ghosts’ way almost immediately, Gordon opener Cameron Eccles remained at the crease for almost the whole day, frustrating the Ghosts in the process. The Ghosts quick bowlers all experienced some success. Left arm bowler Luke Webb led the attack striking early with the Gordon score on 3 runs. This was the first of Webb’s three wickets. He went on to claim 3/56 off 15 overs. Then Iain Carlisle struck with a fine catch in the deep by Sam Skelly. Carlisle finished with 2/49 and Skelly bowled with good pace for an economical 40 runs off his 14 overs. While the Ghosts three-pronged pace attack dismissed half the Gordon batsmen, 16 year old Tanveer Sangha claimed the rest. The Ingleburn teenager was superb in his first two day game in first grade. He drew respect from the cautious opposing bats, spinning the ball with good flight. Sangha bowled with complete trust from his skipper, Burke happy to see the leggie bowl over a quarter of the day’s overs from the western end. Besides assistance from Iain Carlisle taking a catch, Sangha did the rest by himself. His five wicket haul consisting of three LBW dismissals and a return catch off his own bowling, finishing with figures of 5 for 79. With eight overs left in the day’s play, Gordon were back in the sheds for 279 runs, leaving the Ghosts a horrible short period to conquer in failing light. At first the Ghosts openers look set to see out the day’s play, scoring comfortably until both were caught within minutes of each other. At stumps the Ghosts were 2/25 with Phil Wells and night watchman Luke Webb at the crease. Play resumes next Saturday at Raby at 10.30am. The locals require 255 runs with 8 wickets in hand.